In transition offense, seek first to score, then flow seamlessly into offense from these common endpoints. The first objective of transition offense is to score with an advantage. Coaches and players should keep this top of mind. Upon the rebound/inbound the offense uses pace, spacing and rapid advancement of the ball in hopes of scoring early and with a numbers advantage. When the defense does its job and neutralizes any numbers advantage or retards advancement of the ball, the offense is then forced to create an advantage using some sort of action. Again, seek first to score, then run “offense,” not the other way around. But when forced to flow into offense do so seamlessly and select some common endpoints for that offense to stem from. In this examination, the Spread Ball Screen and the Wing/Side Ball Screen will serve as our common endpoints of transition offense. Reverse engineer the transition game to end at these alignments, but do not lose sight of scoring first without having to use them. Before getting to the endpoints, let’s explore some transition terminology. These terms all are thoroughfares and have a movement connotation. They also create the lane integrity that leads to good spacing once the offense arrives in the front court. Dead Zone – Area from free throw line extended down. Avoid receiving outlets passes in the Dead Zone. Rail – Think of a high-speed rail like the Bullet Train. Wings sprint the rail to the deep corners. 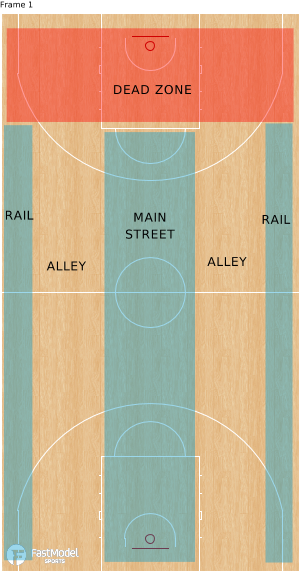 Alley – The ball comes up one alley and another player must use the opposite alley. Main Street – Main Street belongs to the “Bigs.” The rebounding/inbounding big trails in Main Street. Make the outlet pass then find a player ahead with an advantage. Use the long advance pass, or pitch ahead, to get them the ball. We want the ball airborne over the halfcourt line as much as possible. Often on the ballside pitch ahead, the wing receives the pass in the wing area before reaching the deep corner. He/she may have an immediate drive available. If not, Player 1 in the diagram below cuts through to the weak corner after pitching ahead. After seeking first to score with the drive or shot then not having either available, the offense is set up for one of our endpoints, a wing ball screen, with Player 5 sprinting into the screen from his/her trail position. One benefit of a Five-Out Break is the middle third being clear for the ball handler to attack. There is no post player (and his/her defender) clogging the paint. Should the defense take away the pass to the wings, they do so while leaving the middle open for a dribble attack. This is what is meant by thinking “scoring” before thinking “offense” – score in the simplest way possible and attempt that first. If the middle third is wide open, attack the rim and look to finish. Should the defense collapse to protect the rim, inside-out passes are available for shooters. In the diagram above, Player 1 attacks the middle of the court looking to finish at the rim or draw defenders. This is the essence of simplistic offense – seek to manufacture points by the simplest most straightforward means first. Advancing the ball deep with the dribble up the alley elicits a dribble push. If the ball reaches free throw line extended the ballside corner player pushes through to the opposite corner. The ball handler can wave the corner player through with a non-verbal signal. Creating the “empty corner” and clearing out the side can provide a lane for the ball handler to attack the rim up the alley as well. 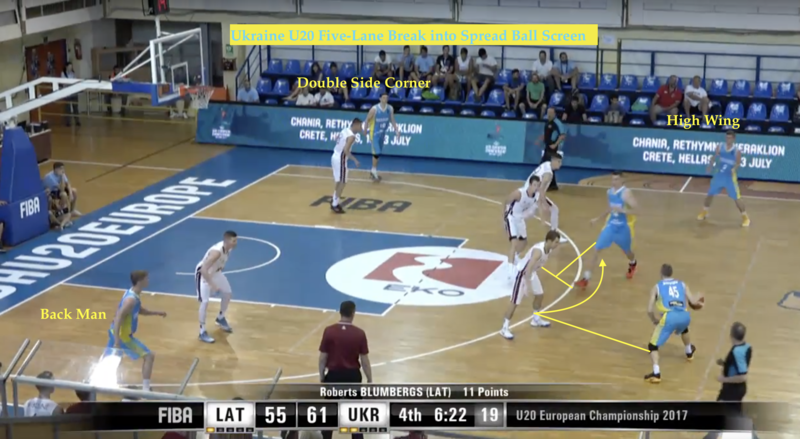 If the ball handler is unable to attack from the side, the offense is again set up for one of our endpoints – the wing ball screen – with Player 5 sprinting into the screen from his/her trail position. There are also times that due to the randomness of the game, players do not fill lanes with the perfect symmetry. This is another benefit of common endpoints. So long as the offense can arrive at an endpoint, they can flow into an action to create an advantage. 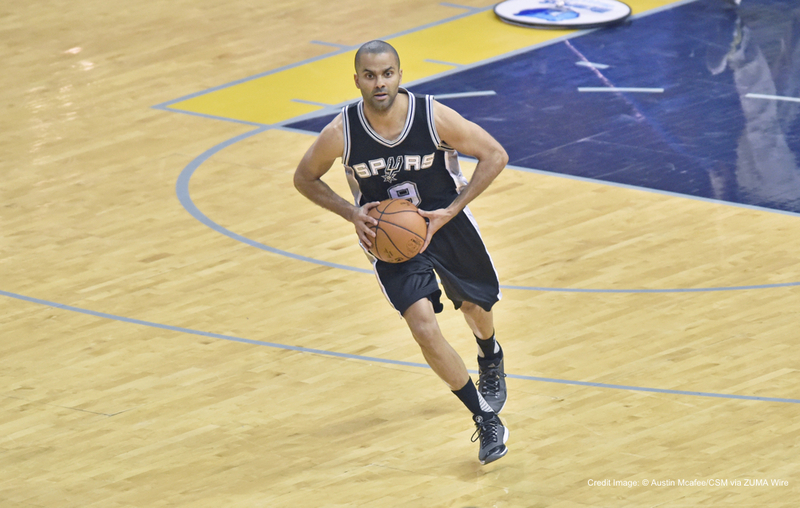 Above, Tony Parker is advancing the ball in transition and the ballside corner is empty while two wings are in the opposite rail. Parker should seek first to attack the rim from the side or take his man at or below the free throw line extended and receive the wing ball screen from Boris Diaw who is filling Main Street. This is not the perfect-world break we see in the diagrams but a way to get to a familiar endpoint when the floor is slightly tilted. There are times when the ball is simply dribbled up the alley, no pitch ahead or dribble attack is available and the ball handler settles at the high wing. The offense sought first to score, no opportunity was available and the offense must flow into offense. With the dribble entry, the offense is set up to create an advantage with the spread ball screen. The player trailing in Main Street can move into position to create with the high ball screen. The image below demonstrates this option. To review, the diagrams below show the endpoints of the transition offense. 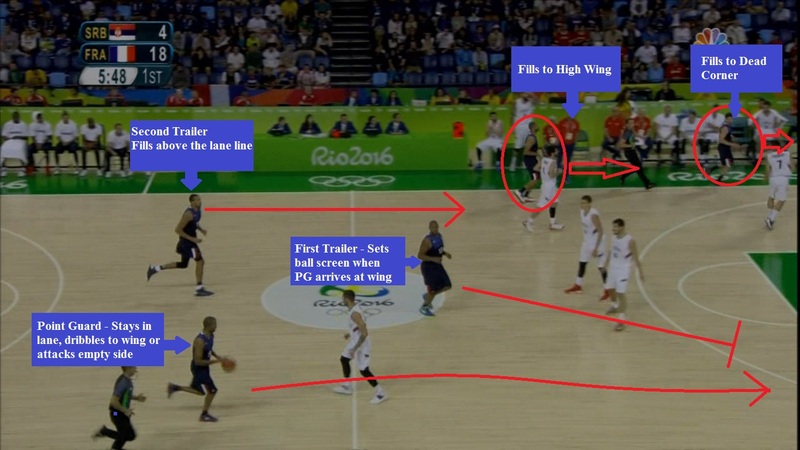 The pitch ahead and dribble push lead to the wing ball screen while the dribble entry leads to the spread ball screen. The endpoints provide a familiar alignment from which to create an advantage. Remember, these endpoints are akin to backup plans. The mindset is to seek to score first then run offense. Score in transition if an opportunity is there; if not, create an advantage from one of the associated endpoints. These options need no call from the bench; they flow organically. There is no “set it up” moment that allows the defense to entrench. Seek to score with an advantage via pace and tempo. When the defense is able to prevent that, flow into an endpoint from which an advantage can be created.